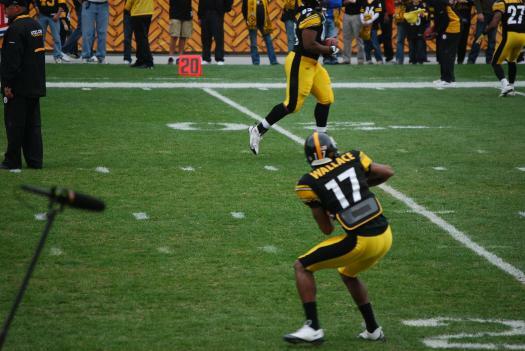 Are Steelers WR Mike Wallace, LB Lawrence Timmons AFC Pro Bowl Snubs? Troy Polamalu and James Harrison were named starters to the AFC Pro Bowl roster, while rookie Maurkice Pouncey was named to the team, giving the Steelers 3 representatives for the game. All three are worth but the two prominent names coming up right now is wide receiver Mike Wallace and linebacker Lawrence Timmons. Here’s a select group of Steelers who were on the cusp of making it and a few arguments for those who should have made it. At the running back position, Maurice Jones-Drew (1,324 yds, 4TD), Jacksonville, Arian Foster (1,436 yds, 14TD), Houston, and Jamaal Charles (1,380 yds, 4TD), Kansas City were the three running backs named to the team. It’s hard to argue against any of three as all three players rank 1-3 in the AFC in rushing. Has Rashard Mendenhall had a pro bowl season? He’s on the cusp but he’s not a snub. Mendenhall is 6th in the AFC in rushing with 1,237 yards and tied for 2nd in touchdowns with 11. He was a pivotal player in the Steelers starting 3-1 without Ben Roethlisberger and has emerged as an all-around back but he hasn’t been consistent enough and the Steelers not using Mendenhall in the passing game as much on 3rd downs hurt his all-purpose yards. The wide receiver position is where many Steelers fans are heated as Mike Wallace was left off the roster. The Pro bowl is all about stats but from a pure impact standpoint you can make a strong argument for Wallace. Andre Johnson, Houston and Reggie Wayne, Indianapolis were named starters, with Brandon Lloyd, Denver and Dwayne Bowe, Kansas City rounding all the four receivers named to the game. Reggie Wayne leads the AFC with 102 receptions and has 1,287 receiving yards and 5 TD’s. Andre Johnson, the starter alongside Wayne is tied for 2nd in the AFC with 86 receptions and has 1,216 receiving yards and 8 TD’s. Denver’s Brandon Lloyd leads the NFL in receiving yards with 1,375 receiving yards and has 72 receptions and 10 TD’s. Kansas City’s Dwayne Bowe has 67 receptions for 1,094 yards and AFC leading 15 TD’s. From a reception standpoint, Mike Wallace is not even in the ballpark, ranking 23rd in the AFC with 57 receptions. However, Wallace is 4th in the AFC in receiving yards with 1,152 (6th in NFL), 1st in the AFC averaging 20.2 yards per catch, 1st in the NFL with 24 receptions of 20+ yards, tied for 2nd in the NFL/AFC with 8 receptions of 40+ yards and is tied for 3rd in the AFC with 9 TD’s. The next hot topic is Lawrence Timmons at the middle linebacker position. Baltimore’s Ray Lewis was named a starter and New England’s Jerod Mayo was the second inside linebacker named to the team. There’s no denying Mayo being named to the team. The young linebacker leads the NFL with 169 tackles. Where the discussion appears to be centered around is Ray Lewis whose a starter based off of merit. Statistically, Lewis (128 tackles) has two more tackles than Timmons (126) but there wasn’t a more dynamic linebacker than Timmons for the first 6-to-8 weeks of the season. He hasn’t been as dynamic during the second half but his drop off hasn’t been significant by any means. Hard to come up with an argument that he hasn’t been one of the top linebackers in the AFC this season. James Farrior has also played extremely well and has been one of the top inside linebackers in the AFC but he just doesn’t have the numbers to garner serious consideration. There’s some argument for Casey Hampton out there too as the Steelers are No. 1 against the run.